This is the fifth article in a series of articles that a few of us will be writing this summer. This is the For Your Summer Binge Consideration series. Each article will talk about a show that will be returning for its second season in the 2017-18 season, and why you might want to watch the first season before the second season premieres. We continue with Trial & Error. In the realm of comedy, the spoof is always one of the best ways to get your audience engaged. There's just something incredibly entertaining about imitating a normally serious genre purely for comedic effect. With so many crime and law documentaries out there, it was only a matter of time before a comedy came to make fun of them. That comedy, of course, is NBC's 'Trial & Error'. 'Trial & Error' focuses on New York lawyer Josh Segal (Nicholas D'Agosto) who's traveled to East Peck to defend poetry professor Larry Henderson (John Lithgow). Larry has been accused of murdering his wife and it's up to Josh and his rag-tag team to prove him innocent. The 13-episode first season is loads of fun. The comedy really comes from just how quickly Larry can get into hot water through misunderstandings and inaccurate media coverage. While watching the series, you really feel Josh's frustration as he tries to keep his client out of trouble and his ragtag team in check. That team consists of Anne Flatch (Sherri Shepard) and Dwayne Reed (Steven Boyer). What I like about these two is that while they may seem incredibly incompetent at their jobs, they end up redeeming themselves with one of the two even solving the murder case (I won't say who it is or how because this is a spoiler-free article). Summer (Krysta Rodriguez), Larry's daughter, works well as a straight-man as she tries to make sure her father doesn't get the death penalty. While she's not the center of comedy, she really gets her time in the spotlight in a few select episodes. Finally, there's Carol Anne Keane (Jayma Mays). The best antagonists are the ones you love to hate. That's precisely the role that May's plays in the show. Ultimately, the main players in 'Trial & Error' are hilarious and play their parts well. Since 'Trial & Error' is a murder-mystery, there are many twists & turns throughout the inaugural season. Not many comedies have cliffhangers each week, so it's great that the show is serialized and molded like a drama even though it's a comedy. The twists also make it difficult to find out who really killed Margaret Henderson since there's at least one new suspect every other episode. Despite its comedic nature, the stakes are still very high. If Larry is proven guilty, he will end up being killed by a bear, so it's a life-or-death situation. At the same time, it's possible that Larry himself is guilty, so proving him innocent may not be the best idea for Josh and crew. This type of conflict is what makes 'Trial & Error' a joy to watch. Each episode provides something interesting and new and raises the stakes a notch higher. Ultimately, there's not a single episode I would recommend watching alone. The show is serialized, so it's best to watch all 13 in order. And while the finale ends up tying all loose ends, I'm still very excited to see where 'Trial & Error' will go next. There isn't much else to say about 'Trial & Error'. The series is a comedy gold mine with a refreshingly creative premise. The cast is great and there's even a surprising amount of heart towards the end. Check out the trailer below and see for yourself. 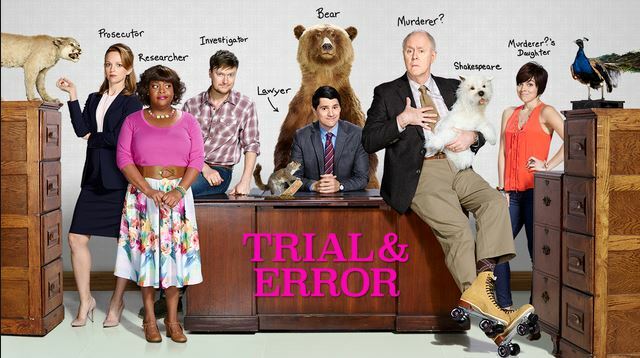 Will you be watching 'Trial & Error'? Are you already a fan? Leave your thoughts in the comments below.